I feel like it is no secret that law school requires a ton of reading. It is a huge part of being a lawyer so naturally, it should be a big part of the process of becoming a lawyer. I have always been an avid reader. I was not uncommon for my middle school self to check 20-30 books at a time out from our local library because I would buzz through them so fast. My parents had to take the nightstand light out of my room because I would stay up until the wee hours of the morning reading. When people warned me that law school was largely about reading and lots of it, I thought, "bring it on". Even though I knew I would be doing a lot of reading going into law school, the sheer amount was still a surprise and took some serious getting used to. 30 pages per class per night doesn't seem that bad at face value... but it is so much more than just 30 pages. Not only is the reading super long, it is super dense, it is often full of words you need to look up, footnotes that need to be referenced and sometimes cases that should be skimmed because they are mentioned within the reading. You also need to take notes as you go and sometimes read a section more than once to grasp the full meaning. 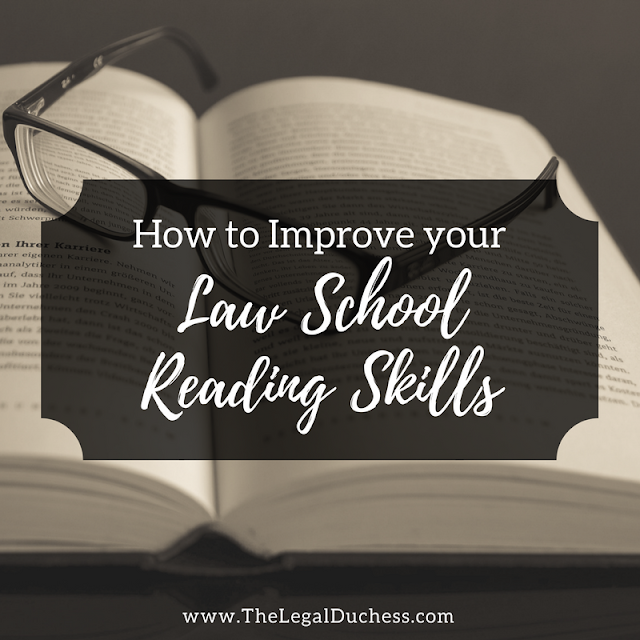 Reading for law school is a skill that improves over time with practice. In my time in law school, I am certain that my reading skills have improved substantially. Below I have outlined a few of the tips and tricks that have helped me to improve my reading for law school to make it go faster with better retention of the material. Put down your highlighter. Make marginal notes or comments instead. Every time you feel the urge to highlight something, write instead. You can summarize the text, ask questions, give assent, protest vehemently. You can also write down keywords to help you recall where important points are discussed. Above all, strive to enter into a dialogue with the material instead of just passively highlighting. Make outlines, flowcharts, or diagrams that help you to map and to understand ideas visually within your reading notes. Read each case carefully and then determine “what it says” and “what it does.” Answer “what it says” in only one sentence; this is basically your rule statement from an IRAC style case brief. Represent the main idea of the case in your own words. To answer “what it does,” describe the cases purpose within the section- why is this case important? Why is it in this part of the book? Write a summary of a section or chapter in your own words. Do this in less than a page. Capture the essential ideas and perhaps one or two key cases that are used. This approach offers a great way to be sure that you know what the reading really says or is about and can offer a quick and dirty summary of the reading. Teach what you have learned to someone else! Research clearly shows that teaching is one of the most effective ways to learn. If you try to explain aloud what you have been studying, (1) you’ll transfer the information from short-term to long-term memory, and (2) you’ll quickly discover what you understand — and what you don’t. Meet up with your friends before class and teach them what the case was about or what alegal term from the reading means. As I mentioned several times in the first part, I take notes while I read. It helps to keep me fully engaged in the material as I practice active reading. It also provides a crutch to use when answering a cold call in class. My reading notes are generally pretty messy because I know I will be making adjustments during class. 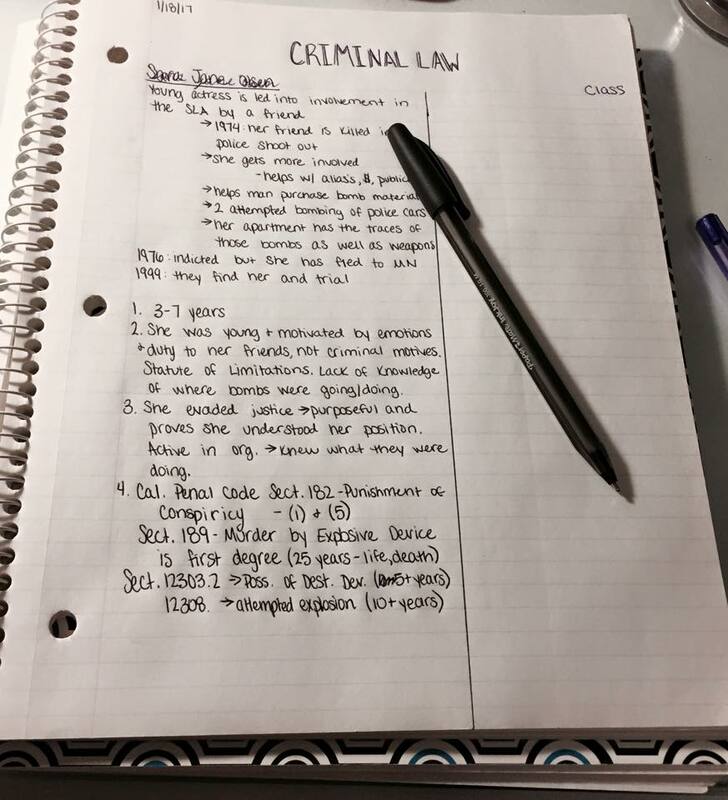 I make sure to include in my reading notes the main points of the section, any law mentioned, majority/minority rules, rationales of public policy, definitions for any words or phrases I do not know and of course case breifs for every case. I generally write my reading notes in black on about half of the page and only on the front side. 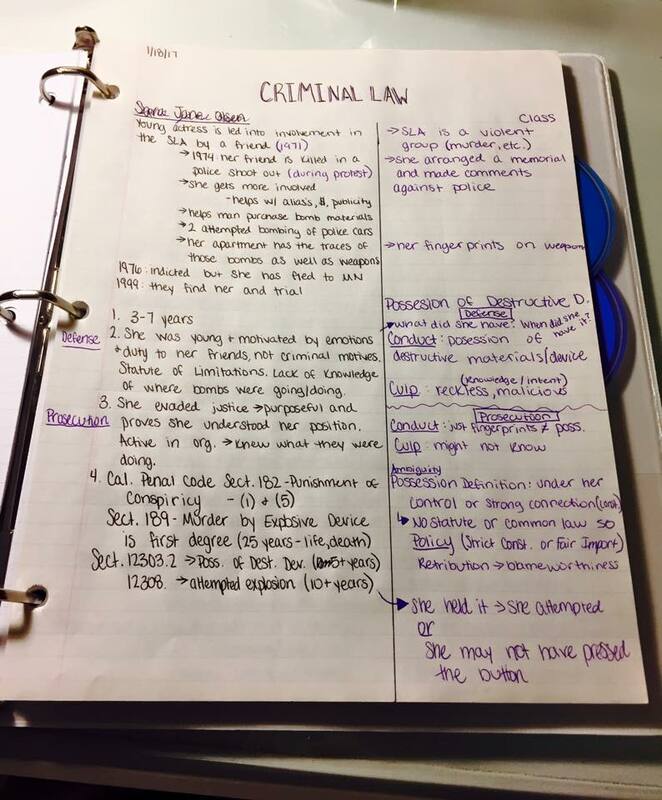 Then my class notes are added in a contrasting color and I have plenty of space thanks to the back side of each note page and the space on the front- this helps me when I go back to outline and review because I know what information was from the book and what was from the professor in class due to the colors. Sometimes I will type up my reading notes and leave space for class notes in a contrasting color... it just depends on what I am feeling like doing when I am reading. Taking notes while I read is more beneficial for me than highlighting because I actually have to pause, think about how I want to write that in my notes and then proceed to write it down- it is a much more active process and helps me to synthesize and understand the reading better than if I was just highlighting passively as I went through and never really pausing to consider the material. I always like to plan out my reading into chunks. I pick out a number of pages or a "chunk" I want to get read before taking a break. I write this down on a sticky note and cross off each chunk completepelte it. This way I have a set break time and it helps me to focus and power through the dedicated chunk of reading because I know there is a short break on the other end. If I do not do this, I end up pulling my phone out after every few paragraphs and my reading will take three times as long because I am so distracted. I also strategically plan out when I will do my reading during the week. Sunday afternoons I read for my Monday and Tuesday Classes. Monday morning I read for my Wednesday and Thursday classes. This way, I do not stress about when I am going to fit my reading in because I already have time allocated for it in my weekly schedule. Understanding what time during the day you are at your best will help you read better. If you know you are most awake and focused in the morning, plan your reading for the morning. If you are a night owl and don't come alive until 10pm, read from 10pm-1am. If you have neighbors who always blare music in the afternoons, make sure that your reading is not allocated for afternoons because it will likely be very hard to focus. As for location, you know best what locations makes you the most productive. Some people study best at home; some have to be at school. Some people prefer a quiet coffee shop and others like to be outside. Whatever works best for you to be focused- do your reading there. If you like pure silence while reading, invest in earplugs or noise canceling headphones. If you need some background noise while reading, I highly suggest websites that play white noise like waves/falling rain or instrumental music without lyrics such as Hans Zimmer movie scores Pandora station (my personal favorite) or any classical music. Make yourself as comfortable as possible: have a comfy spot with good light, not too warm or too cold, ample water and snacks, make sure it is clean and tidy, have all your materials within arms reach and get to work. Whatever reading you do, give yourself at least five minutes to refresh it before class. This way, you know where everything is in your notes, you are comfortable with the material and you will be ready for any cold calls. Flip through the reading in the books, read through your notes and have your materials ready to go when class starts. Best of luck with your massive amounts of law school reading. I hope this is helpful! Hi Brandy! I've been reading your blog for about a year now and last week I found out that I have been accepted into my number one law school! Thanks for all the help and advice and I look forward to continuing to read your blog! With all of the comments you deleted, you must not be a big fan of the 1st Ammendment, huh? Not sure why it is any of your business but the only comments I delete are pure spam because there is no reason for that to be on my page. Hey Brandy! In your first section you mention reading with a shopping list in mind, and that not being effective, what exactly did you mean by this? Hello!! What I am talking about is passive reading. If you read something without your mind being actively engaged, you may read the passage but once you are done you will not have comprehended what it said. What happens to me when I am passively reading is that I will read a paragraph and by the end I have no idea what the paragraph was about because my mind has wandered to what I need to pick up at the store or what I want to wear to court the next day. By keeping my mind engaged through active reading, I force myself to stay focused and to comprehend the reading. I do this by pushing myself to read faster which makes my mind work harder and stay engaged. I hope this helps explain! Thank you for these tips! As a 1L looking to have a more effective/stronger 2nd semester, I really appreciate it.